Figure A shows the normal anatomy and blood flow of the interior of the heart. Figure B shows a heart with the four defects of tetralogy of Fallot. Less blood flow to the lungs. Mixing of oxygen-rich (red) and oxygen-poor (blue) blood inside the heart. Low levels of oxygen in the blood. When oxygen levels are low, the baby's skin, fingertips, or lips have a bluish tint. This condition is called cyanosis. An infant with cyanosis is sometimes called a "blue baby." 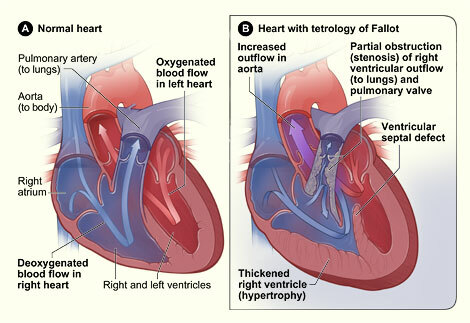 Each year in the United States, about 3,000 babies are born with tetralogy of Fallot. It is the congenital heart defect that causes the most cases of cyanosis. Every infant or child with tetralogy of Fallot needs surgery, usually within the first year of life. Because of advances in surgery and treatment, many children born with tetralogy of Fallot have successful surgery and live to adulthood. The cause of most cases of tetralogy of Fallot is not known. Heredity may play a role. In rare cases, more than one child in a family is born with a congenital heart defect like tetralogy of Fallot. Also, parents who have a congenital heart defect may be more likely than other parents to have a child with tetralogy of Fallot. Babies who have other birth defects, such as DiGeorge syndrome or Down's syndrome, are also more likely to have tetralogy of Fallot. Research is ongoing to find the causes of congenital heart defects. The signs and symptoms in a baby with tetralogy of Fallot depend on the size and severity of the defects. A heart murmur may be the first sign found by your doctor. It is an extra or unusual sound heard during the baby's heartbeat. Most babies with tetralogy of Fallot have a heart murmur. The heart murmur may not be heard until after the baby is a few days old. The amount of narrowing of the pulmonary valve and surrounding area. Narrowing of the pulmonary valve reduces blood flow to the lungs, lowering the amount of oxygen getting to the body. The presence of a patent ductus arteriosus (PDA). PDA is a persistent connection between the aorta and the pulmonary artery after birth. Before birth, the aorta and the pulmonary artery are normally connected by a blood vessel called the ductus arteriosus. In most babies, the vessel normally closes off within a few hours or days after birth as the baby's circulation shifts from the placenta to the baby's own lungs. In some babies, however, the ductus arteriosus fails to close off as it should and remains open (patent). With PDA, blood flows directly from the aorta into the pulmonary artery. More blood is sent back to the lungs to pick up oxygen, putting a strain on the heart and the lungs. Babies who have a tetralogy spell need surgery as soon as possible. Doctors diagnose tetralogy of Fallot by doing a physical exam of the baby and ordering medical tests. The signs and symptoms usually appear during the first weeks of life. Your infant's doctor may see the signs or symptoms during a routine checkup. Some parents also notice signs of cyanosis or poor feeding and bring the baby to the doctor. If the doctor suspects that there is a problem with your baby's heart, you and your infant will be referred to a pediatric cardiologist (a specialist who treats heart problems in children). The specialist will take a family and medical history, do a physical exam, and order several tests. Listens to your baby's heart. The doctor uses a stethoscope to check for a heart murmur. Looks for signs such as bluish color of skin and lips and rapid breathing. Looks at general appearance. Some children with tetralogy of Fallot have a characteristic facial appearance that is associated with DiGeorge syndrome. Listens to your baby's lungs. An echocardiogram, which is harmless and painless, uses sound waves to create a moving picture of your baby's heart. During an echocardiogram, reflected sound waves outline the heart's structure completely. The test allows the doctor to clearly see any problem with the way the heart is formed or the way it's working. An echocardiogram is the most important test available to your baby's cardiologist to both diagnose a heart problem and follow the problem over time. In babies with tetralogy of Fallot, the echocardiogram outlines all of the defects and shows the cardiologist how severe each one is. The test also shows the doctor how well your baby's heart is adapting to the structural problems, and it helps the doctor to decide when and what kind of surgery should be performed. During pregnancy, if your doctor suspects that your baby has a congenital heart defect, a special test called a fetal echocardiogram can be done. This test uses sound waves to create a picture of the baby's heart while the baby is still in the womb. The test is usually done during the fifth month of pregnancy. If your child is diagnosed with a congenital heart defect before birth, your doctor can plan treatment before the baby is born. Cardiac catheterization is another test often performed to diagnose heart problems. In this test, a thin, flexible tube is placed in the top of your baby's leg or arm and passed through an artery or vein to reach the heart. Using X-rays, your baby's doctor can see the baby's blood vessels and heart. The doctor can also measure the pressure inside the heart chambers and determine how much oxygen-rich and oxygen-poor blood is mixing between the two sides of the heart. A cardiac catheterization can also show if the arteries that supply the heart with blood (the coronary arteries) are normal. Cardiac catheterization is sometimes performed if the results of the echocardiogram are not clear or if the doctor suspects other heart problems. Pulse oximetry. This test uses a sensor to see the level of oxygen in the baby's lungs. This provides information on how well your baby's lungs are passing oxygen into the blood and if oxygen-rich and oxygen-poor blood are mixing. The sensor (like an adhesive bandage) is placed on the baby's fingertip or toe. A small computer unit shows the amount of oxygen in the blood sensed through the skin. This test is painless. Chest X-ray. A chest X-ray takes a picture of your baby's heart and lungs. It can show if your baby's heart is enlarged or if there is any fluid in his or her lungs. Electrocardiogram (ECG or EKG). This test measures the rate and regularity of your baby's heartbeat. Blood work to measure blood counts and oxygen levels. A special blood test to see if your baby has DiGeorge syndrome. All infants and children with tetralogy of Fallot must have surgery to repair the defects or help improve their symptoms. Sometimes, teenagers or adults also need surgery to correct continued problems. Closing the ventricular septal defect (VSD) – the hole in the inner wall of the heart between the lower chambers. A patch is used to cover the hole. This cover stops the mixing of blood between the chambers. The oxygen-rich blood now flows out of the heart only to the body, and the oxygen-poor blood goes to the lungs. Opening and enlarging the area that blood flows through as it leaves the lower right side of the heart. The thickened heart muscle is opened, or a small amount of heart muscle is removed. This improves the flow of oxygen-poor blood to the lungs so that it can pick up more oxygen. Opening or widening the pulmonary valve (between the right ventricle and the pulmonary artery). The valve can be opened using a special instrument, but often a patch is sewn on the heart to make the narrow area bigger. This increases blood flow out of the heart to the lungs. Some babies are too weak to have open-heart, corrective surgery. They have temporary surgery, which does not repair the defects of tetralogy of Fallot, but partially improves oxygen levels in the blood to give the baby time to grow and get stronger so the problem can be fixed later. Placing a tube (called a shunt) between a large artery branching off the aorta and the pulmonary artery. One end of the shunt is sewn to the pulmonary artery, and the other end is sewn to an artery branching off the aorta. This creates an additional pathway for blood to travel to the lungs. This new pathway allows some of the blood in the aorta to flow through the tube into the pulmonary artery, where it travels to the lungs to pick up oxygen. The shunt is removed when your baby's heart defects are repaired during the corrective surgery. After surgery, your baby may need medicines to help keep the new blood pathway open. Babies with tetralogy of Fallot can tire while nursing or feeding. You may need to feed your baby more often. Some babies also need extra nutrition. This is given as a supplement or an extra feeding. These feedings usually are formulas that give the baby extra calories. Many babies need extra vitamins or iron. Your child's doctors will decide what extra nutrition your baby might need. Lowering your baby's anxiety or stress can help prevent tetralogy "spells" and save the baby's energy. You can try to predict what your baby needs to stop or to lessen crying. For example, picking up an infant slowly and speaking in a soothing voice can avoid startling a baby. Bring the baby's knees up tight against the baby's chest (the knee-chest position). Attempt to calm the baby. Call 911 (in the US) if your baby's symptoms do not immediately improve. Even if the baby's symptoms improve at home without emergency treatment, you should still contact your doctor to report the spell. After temporary surgery, your baby may need medicines to keep the shunt open while waiting for the corrective surgery. These medicines are stopped after the shunt is removed during the corrective surgery. It is rare to need medicines after corrective surgery unless there are other problems. Your baby may need to take medicines to prevent a serious respiratory infection called respiratory syncytial virus (RSV). Because of having the heart defect, your baby may be more prone to get this infection. Your pediatrician or family doctor will decide if your baby needs any medicines to prevent RSV. With new advances in testing and treatment, most children who have tetralogy of Fallot repaired with surgery survive to a healthy adulthood. Parents of children born with tetralogy of Fallot often think that they did something to cause the problem. It is important that parents know that they did not cause their child's illness. Treatment and care for your child can be costly. The cost of surgery and hospital stays is very high. Your health insurance may not pay for everything. Many parents need help to cover medical bills. You can get information from your doctor and hospital about how to apply for financial aid. It is important that you keep your health insurance current. If you think about changing jobs, check to see if the health insurance at the new job will cover a child who has tetralogy of Fallot. Some health insurance plans may not cover some medical conditions that you or your family had before joining the new plan. It is also very important for your child to have health insurance as adulthood approaches. Review your current health insurance plan. Find out how coverage can be extended beyond age 18. Some policies may allow you to keep your child on your plan if he or she remains in school or is disabled. The care and treatment of a child with a complex congenital heart condition like tetralogy of Fallot can be very stressful for families. This is especially true during the period surrounding the surgery. Support is very important. Talk to your doctor or hospital social worker about a parental support group in the area. In these groups, you can talk with other parents who are going through the same thing. Counseling can also be very helpful. Holter monitor. The Holter monitor is a small box that is usually worn for a 24-hour period. The Holter monitor provides a continuous recording of heart rhythm during normal activity. Echocardiogram. This test, which is harmless and painless, uses sound waves to create a moving picture of your baby's heart. During an echocardiogram, reflected sound waves outline the heart's structure completely. The test allows the doctor to clearly see any problem with the way the heart is formed or the way it's working. An echocardiogram is the most important test available to your baby's cardiologist to both diagnose a heart problem and follow the problem over time. Stress test. Some heart problems are easier to diagnose when your heart is working harder and beating faster than when it's at rest. During stress testing, you exercise (or are given medicine if you are unable to exercise) to make your heart work harder and beat faster while heart tests are performed. During exercise stress testing, your blood pressure and EKG readings are monitored while you walk or run on a treadmill or pedal a bicycle. Other heart tests, such as nuclear heart scanning or echocardiography, also can be done at the same time. These would be ordered if your doctor needs more information than the exercise stress test can provide about how well your heart is working. If you are unable to exercise, a medicine can be injected through an intravenous line (IV) into your bloodstream to make your heart work harder and beat faster, as if you are exercising on a treadmill or bicycle. Nuclear heart scanning or echocardiography is then usually done. During nuclear heart scanning, radioactive tracer is injected into your bloodstream, and a special camera shows the flow of blood through your heart and arteries. Echocardiography uses sound waves to show blood flow through the chambers and valves of your heart and to show the strength of your heart muscle. Your doctor also may order two newer tests along with stress testing if more information is needed about how well your heart works. These new tests are magnetic resonance imaging (MRI) and positron emission tomography (PET) scanning of the heart. MRI shows detailed images of the structures and beating of your heart, which may help your doctor better assess if parts of your heart are weak or damaged. PET scanning shows the level of chemical activity in different areas of your heart. This can help your doctor determine if enough blood is flowing to the areas of your heart. A PET scan can show decreased blood flow caused by disease or damaged muscles that may not be detected by other scanning methods. It is important for anyone with tetralogy of Fallot to have routine dental care to prevent tooth decay, which can lead to infections in the heart. Throughout your child's life, he or she should take antibiotics before any dental procedure, including cleaning. Talk to your doctor before taking your child to the dentist. You may consider having your child wear a medical alert bracelet or necklace. This tells anyone caring for your child that the child has a congenital heart condition. Your pediatrician or family doctor checks your child for growth and development at each routine checkup. Some children with tetralogy of Fallot do not grow and develop as fast as other children the same age. Most children "catch up" after surgery. However, some babies need help. Help your teenager cope with the stresses of growing up with a health problem. Remind your teenager that, with proper care, he or she can grow up healthy and participate in most, if not all, activities. Let your teenager help make decisions about medical care and his or her life. This fosters independence and encourages regular followup with the doctor. Some teenagers or young adults need additional surgery. Over time, the pulmonary valve can narrow, slowing blood flow. The valve may need to be widened or replaced. Your cardiologist will discuss with you and your teenager the need for any additional heart surgeries. Over time, some adults may need medicines to help improve heart function or to help stop irregular heartbeats. A cardiologist can decide if you need any medicines. It is important to check with your doctor before changing or stopping any medicines. Just like teenagers, some adults need additional surgery to repair or replace the pulmonary valve. Other people with tetralogy of Fallot may need to have a pacemaker or defibrillator to help stop or control irregular heartbeats. Your cardiologist will discuss with you the need for any additional surgeries. Adults who were born with tetralogy of Fallot should consider job changes very carefully, because health benefits may change. Some health plans have waiting periods or clauses to exclude some kinds of coverage. Before making any job changes, find out if the change will affect your health insurance. Laws, including the Americans with Disabilities Act and the Work Incentives Improvement Act, protect the employment rights of people with disabilities, including some congenital heart defects.